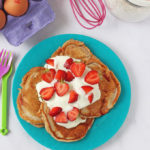 Delicious fluffy pancakes made with yogurt for an added protein boost and sweetened only with honey. Perfect for a snack or breakfast for the whole family. Add the flours, baking powder and baking soda to a large bowl and mix with a spoon. Add the yogurt and egg and mix again. Mix in half the water and check the consistency. If it’s still a little thick add a bit more. Mix in the honey and vanilla and finally add in the chopped strawberries. Add a little oil or butter to a large frying pan, heat and then and use a ladle or large spoon to make four pancakes. Cook for 2-3 minutes on either side, remove and repeat with the remaining mixture. Serve immediately topped with more yogurt and strawberries. The pancakes are best eaten straight away but they can be kept in the fridge for up to 48 hours and reheated in a pan or microwave. They can also be frozen and defrosted at room temperature.